These lowland Scots have been levied into local militias to defend their settlement and bolster armies. 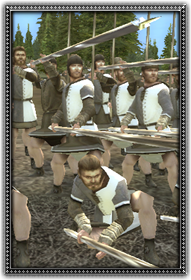 Given some training and equipped with a pike, these units are useful against cavalry and can resist good infantry for a while at least. Their lack of armour and shields make them very vulnerable to archery though.